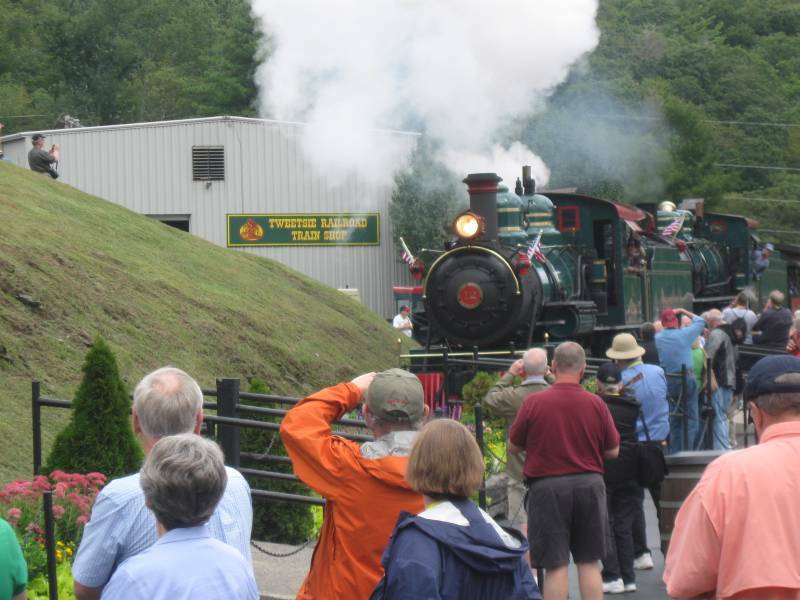 I composed this post 6 weeks ago, but never got it posted….So how about a late report to refresh us all on the joys of the yearly gathering of narrow gauge enthusiasts. This year’s convention was held in Hickory, NC a place I’d never been to. Actually I had never heard of it until it was announced as the 2011 location. I must say, my expectations were low, especially after the great 2011 convention in St. Louis. Again this year I participated in the module displays as a member of the Sn2 Crew. I had planned more work on my modules, but work, life, etc just got in the way. 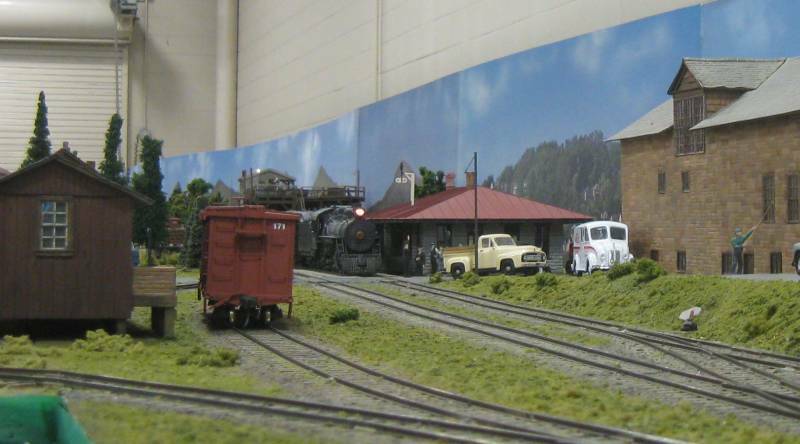 So I went to the convention with only minor improvements: 1) one new structure – White Birch Tank which got damaged during setup (I’ll discuss this in a future post) 2) Auto Reverser on the Bigelow Turntable and 3) some minor scenery and structure improvements. To transport the layout, I used my father’s pickup truck, that has a cap over the bed. He graciously brought the truck over and stayed to help load. His side kick, mom, opened and closed the garage door for us. Additionally, good friend Jim Stewart came over and helped with the loading. It only took us one hour to get it all loaded. Thanks Mom, Dad and Jim. Nice to have such good support. Once in Hickory, Frank Knight, Lee Rainey, Gary Carmichael and I got the whole layout set up in less than 6 hours. Less than the 9 hours for St. Louis. Probably was the great help we received from Yvette Knight and Becky Carmichael. Don Rigling, a friend of mine, also pitched in to help me level and set up my sections. Those additional hands go a long way. 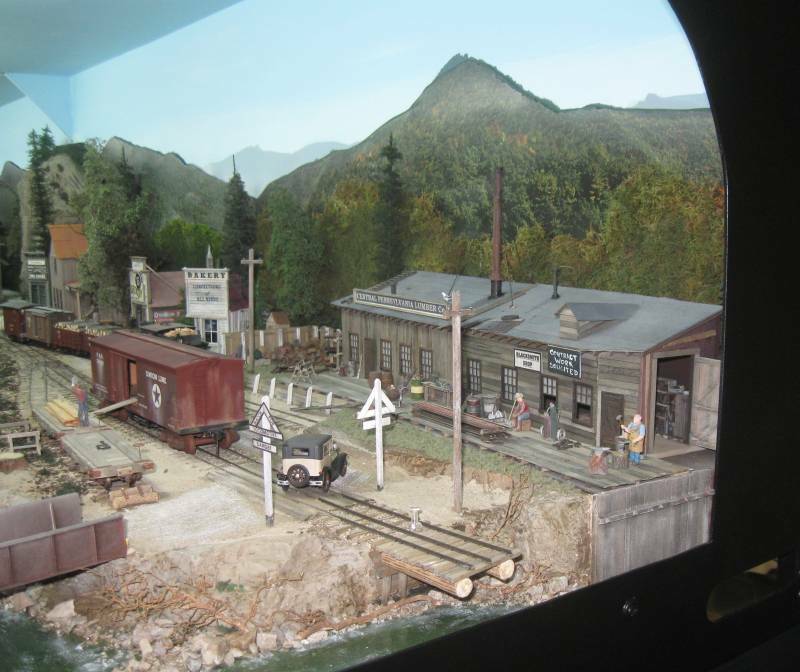 I have an interest in model railroad operations and love partaking in operating sessions. I’ve established TT&TO sessions on two layouts with success. 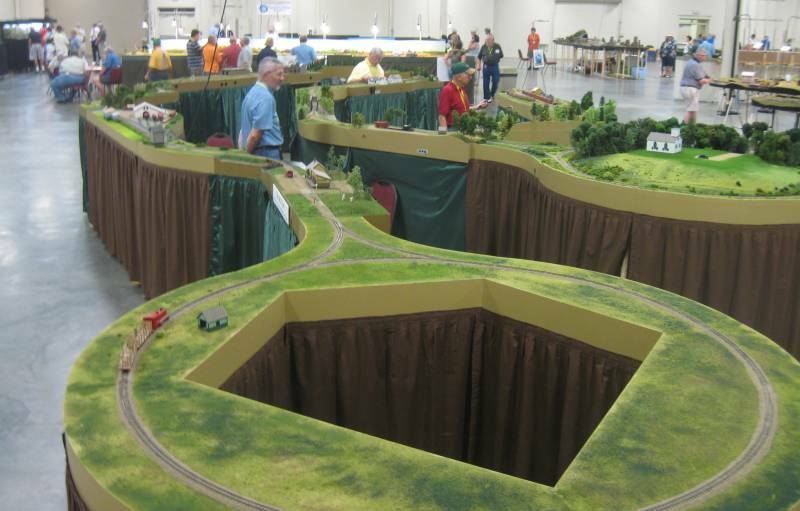 I feel that it’s not required to have a large model railroad to play TT&TO. In Nov 2009, I presented the clinic to the Mini-Bunch her in Cincinnati, so was prepared when it got accepted by the staff of the Hickory convention. The two presentations of the clinic went well. Attendees seem to enjoy the simulated operation of a freight extra. This is an interactive session where members of the audience have the opportunity to think like an operator (of a local freight extra) participating in a TT&TO session. As a result of the clinic I’ve been invited to present it again in Seattle in 2012 (time will tell if I can present at the convention). Additionally, I met a fellow who worked on the railroads and has a collection of train orders. I’m honored to have access to some of his collection. I look forward to reading some of his train orders so I can learn more about railroad dispatching and operations. The Introduction to TT&TO clinic notes have been posted to Sn2 Modeler. PS: I had a mishap that caused me to loose several business cards. One person asked for me to send the clinic. I hope the notes linked above are sufficient. If not, please contact me. There were several modular layouts on display. Many were great. Here are some photos of those that caught my eye. 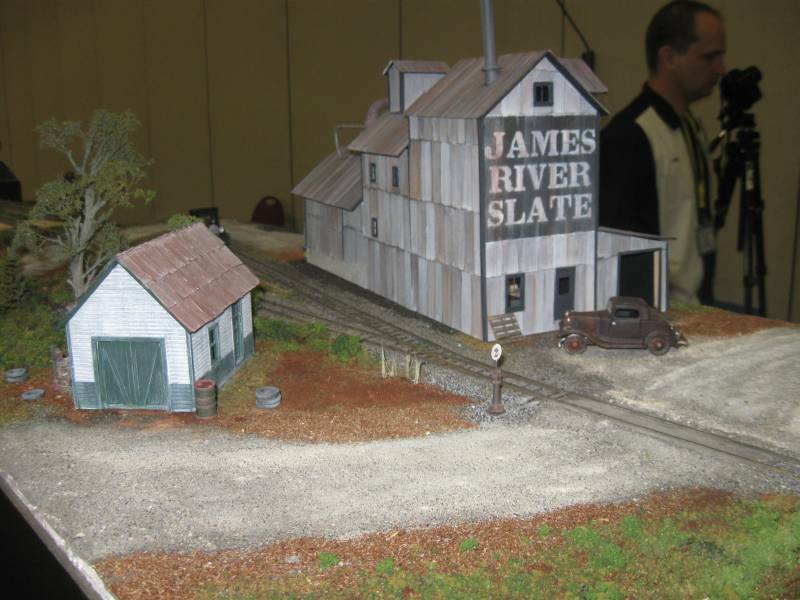 The James River Division On30 Group's Atlantic & Danville layout. Atlantic & Danville On30 layout. Plenty of detail including the order board at the depot. Overall view of the EBT Robertsdale setup. A continuous loop connection was added behind the backdrop. 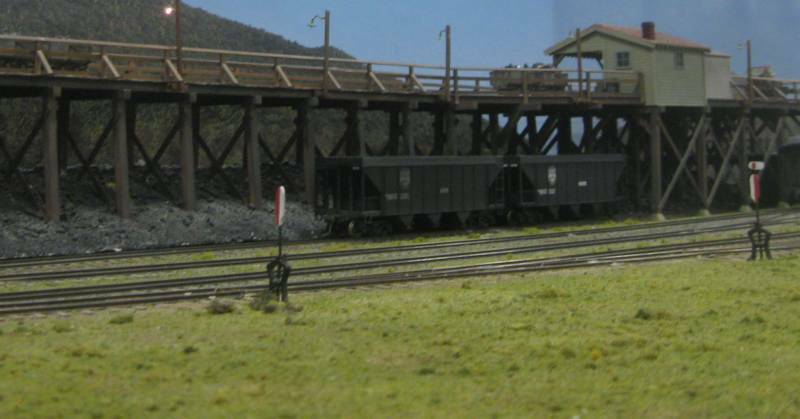 Close up of the EBT coal loading dock. 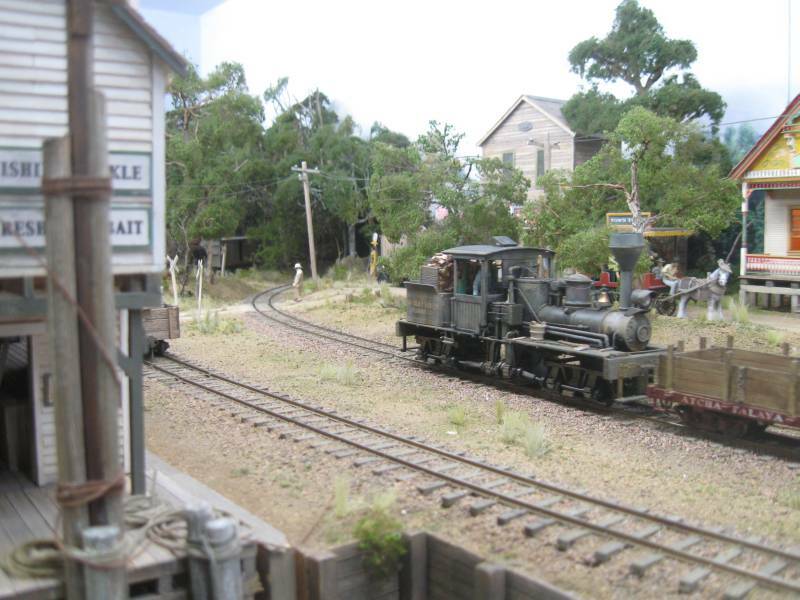 Robersdale station on the On3 EBT layout. The first three are not things we can easily change on the Sn2 Crew layout. The 4th is something that I could do more of on my Sn2 modules. Honestly, my modules lack enough detail to be worthy of comparison with the above mentioned layouts. I’ll have to correct that in the future. Interestingly, none of the above layouts is Prototype. They are all free-lanced. Sn2 Free-mo also lets me model prototype scenes the essence of my SR&RL modeling. The On3 EBT, HOn30 Great Lakes and Sn2 Crew contained the only prototype scenes. Big Run is a free-lance location. The prototype location was a log loading landing. 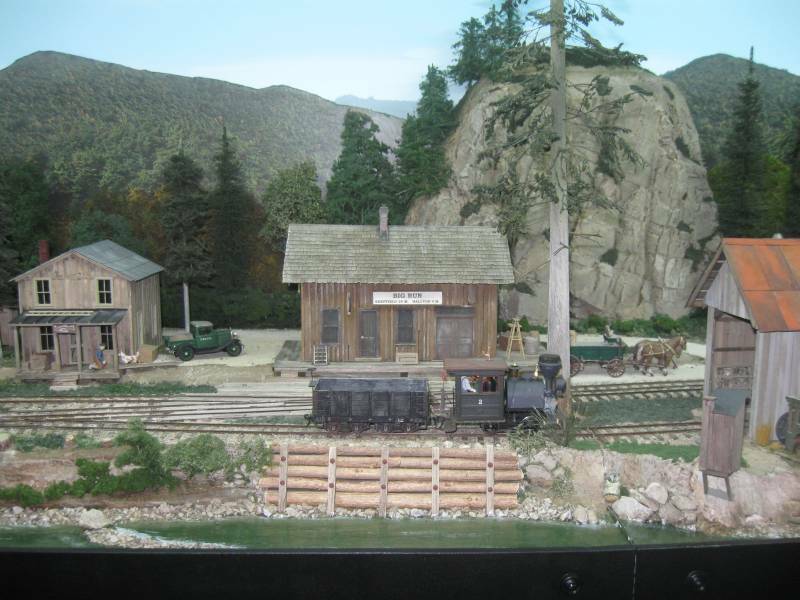 The depot here is based on the Halton, PA depot. A wonderful model. There were a few other On30 layouts making On30 setups out number all other scale gauge modular layouts and along with the two On3 setups made O scale the number one scale for display layouts. I was disappointed that the 7/8n2 layout did not make it…Seeing their 2-foot gauge forney’s is a pleasure. On30 Muskrat Ramble came all the way from Australia. 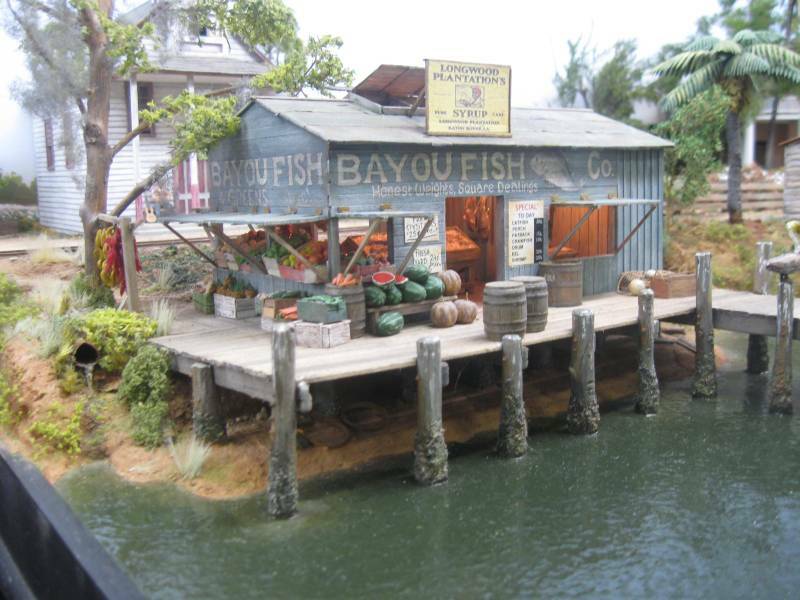 The layout is set in the Deep South Swamps of the United States. This image shows cotton plants in front of a plantation. This scene on the On30 Muskrat Ramble is inspired by a structure built by Sam Swanson. What wonderful detail. It was detail like this that kept viewers returning again and again. There were plenty of clinics, and some I wanted to see. However, I only attended one, my own. Having a display layout and presenting a clinic did not leave me time to see clinics. The vendor room seemed up to snuff. However, I only spend 1.5 hours in there and most of that was shooting the bull. I did not get down all of the isles. The vendor room did have carpet and seemed to have better lighting than the module room. Another miss for me. I walked pasted it 100 times, but was always rushing. This is a pattern for me. At the National NMRA this year I missed the contest room. I do not remember seeing the one last year at St. Louis. I did see the 2007 contest room in Portland. Ah well…next time…. 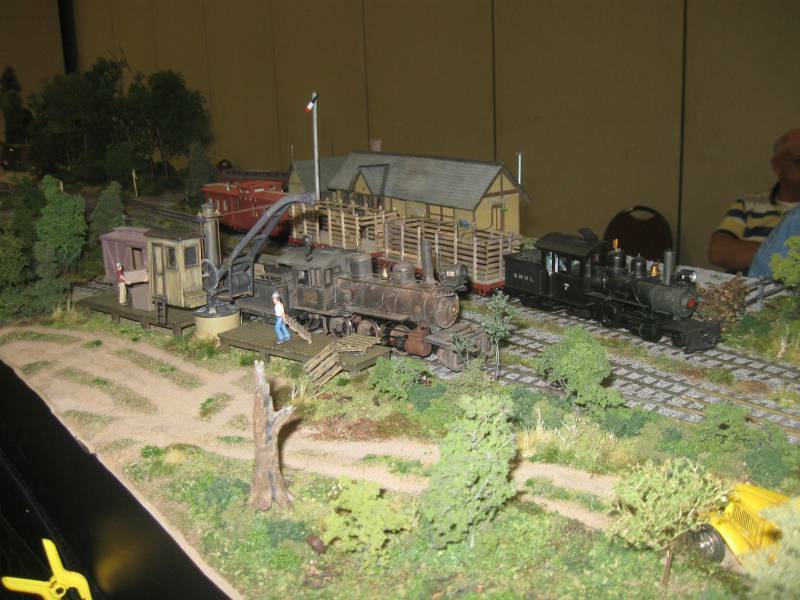 For me, one of the great pleasures of a national narrow gauge convention is the layout tours. St. Louis and Seattle have such great layouts to visit that they are a highlight. Hickory may have had great layouts, but I’d never know it, as the layouts were too far away for me to get to in a reasonable amount of time. Others may have been able to go, but I could not. I had to give clinics and be at the Sn2 crew layout so I could not make a 200 mile round trip to see 3-4 layouts in an afternoon. I hope layout owners were not disappointed by the lack of attendance. That said, I had a great time at The Tweetsie. It reminded me of 1982 when I was 15 and went to the Tweetsie, Johnson City, Boone, Cranberry, Hampton and Elk Park in hopes of finding traces of the ET&WNC. 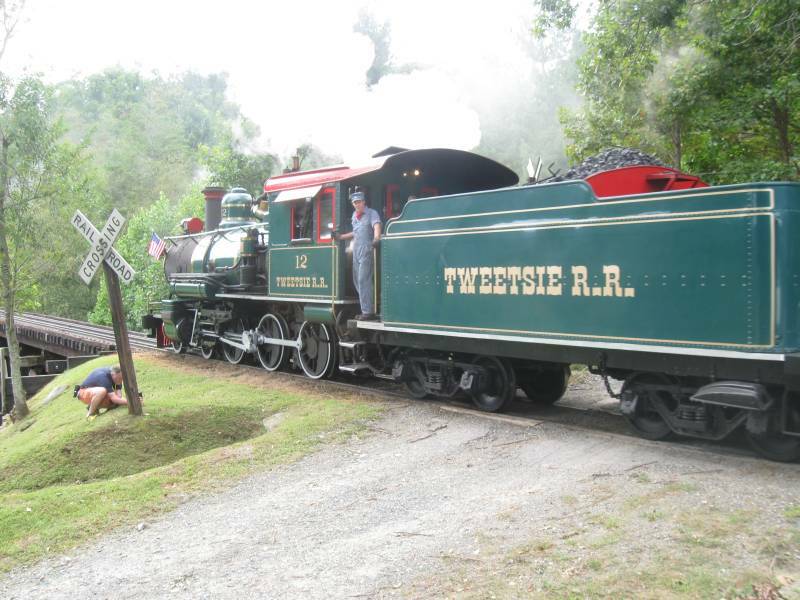 Even though I was unable to ride the train this year (and kind of glad I did) I got to watch the double headed 4-6-0 and 2-8-2 pound their way around the park. 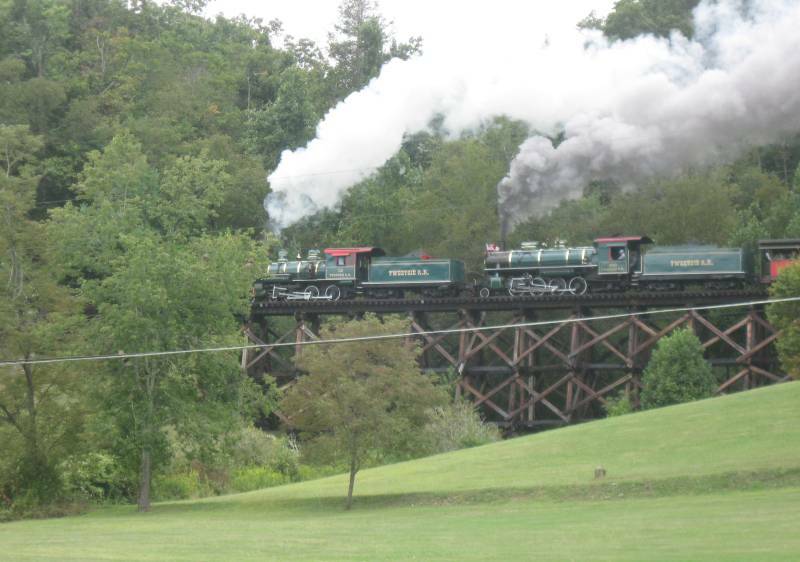 It was wonderful to be in the presence of narrow gauge steam. Having the park all to ourselves was a fantastic and was better than any layout visit. The scenery on the drive up and back was great too. 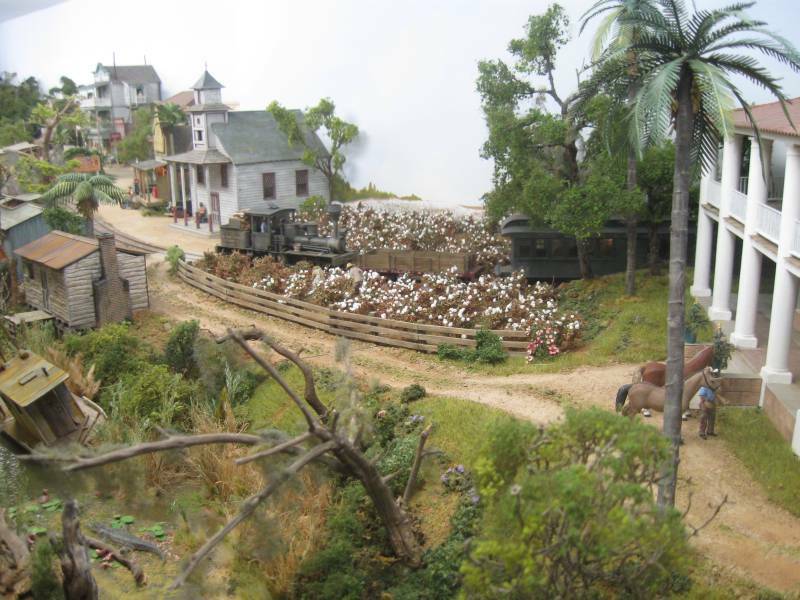 A sea of narrow gaugers slobbering over trains may not seem like a prototype type scene. 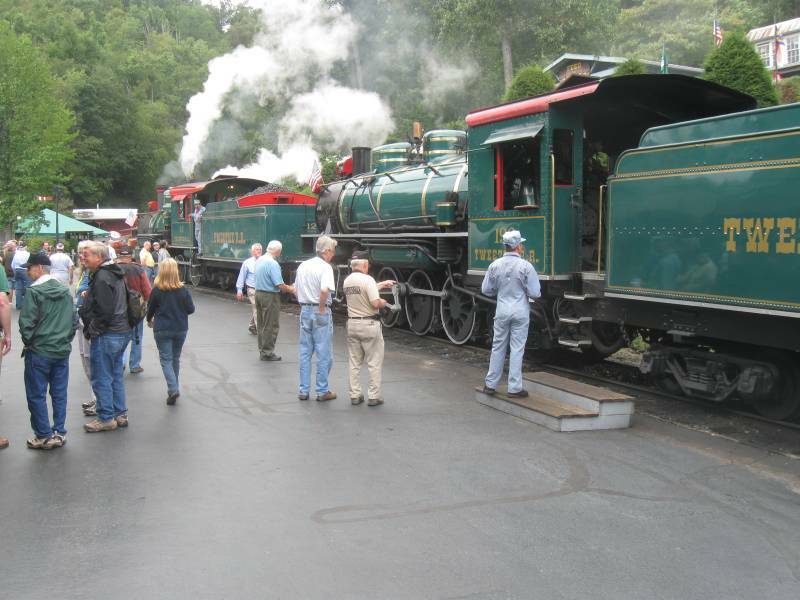 But consider what it must have been like when the first train reach Boone, NC over a hundred years ago. I'm sure the fan fair was even greater. Getting up close and personal with narrow gauge steam was worth it. Soundtraxx will never do them justice. My second day of touring was two spots local to Hickory. 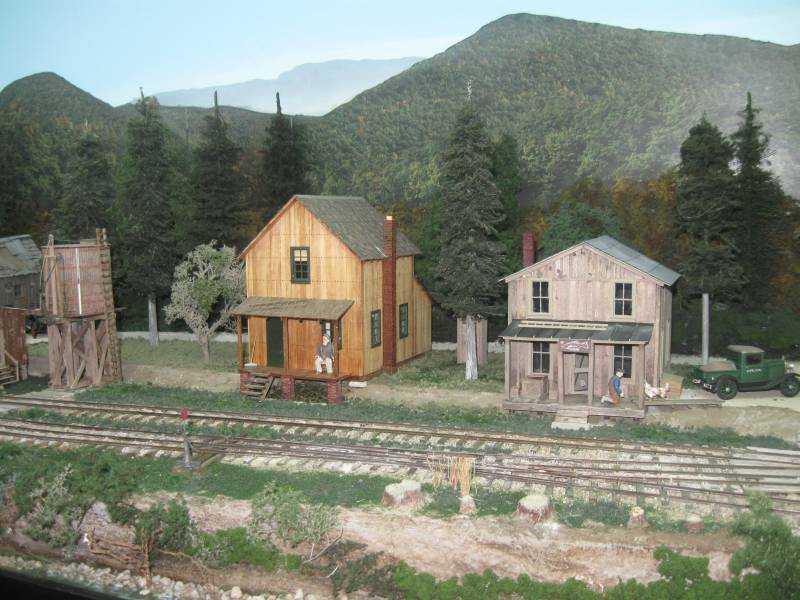 The Alexander Historical society has restored two local NG boxcars and has received a third. Seeing these restored cars in person was fun. One of the resorted cars is a Lawndale (Carolina & North-Western) and the other is an ET&WNC. It was nice to see these cars being taken care of. This group is looking for trucks, I hope they can get some. 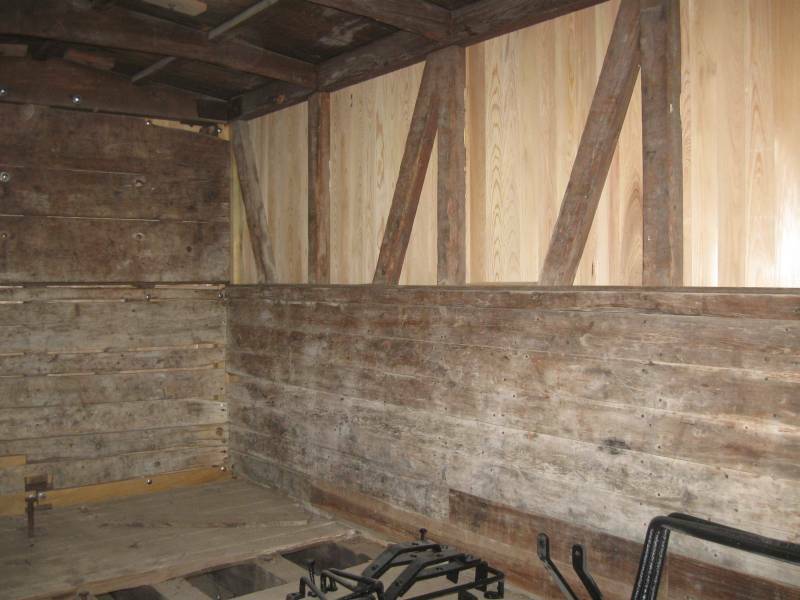 Inside one of the box cars being restored. This convention confirmed to me, that it’s not the venue or the clinics or the layouts that make or break a convention. No matter how good or bad they are, it’s the people that make the convention and for me, Hickory was a winner on People. Don Rigling came from Cincinnati. All of my module frames were built in Don’s basement wood working shop. It was a great pleasure to spend time with Don at his first narrow gauge convention outside of Cincinnati. 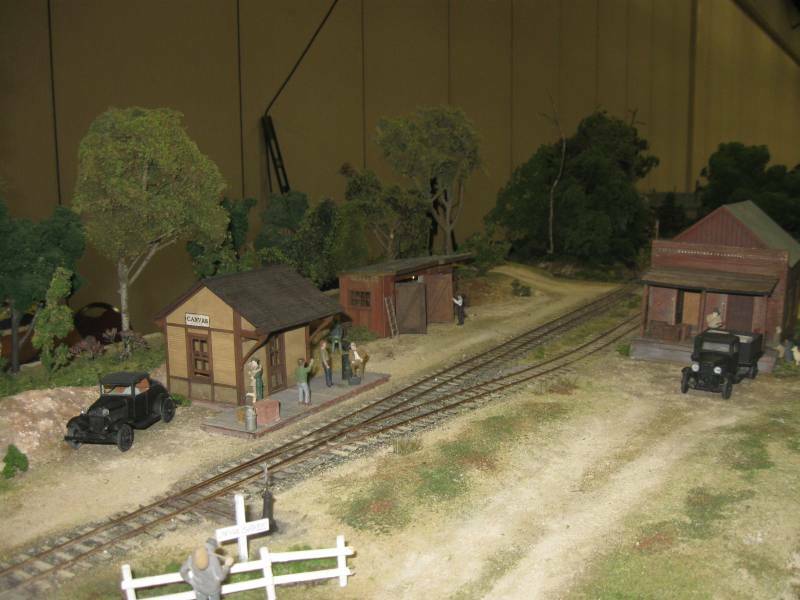 Sn2 Crew – The crew worked well as a team setting up and operating the layout. This distant relationship (Maine, PA, Ohio) continues to work even though we only see each other 1-2 times a year. Maine 2-Foot Guys – I met several 2-Foot enthusiasts I’d never before met. Brain G, who used to live in New England and wrote a series of articles about tracking the SR&RL. 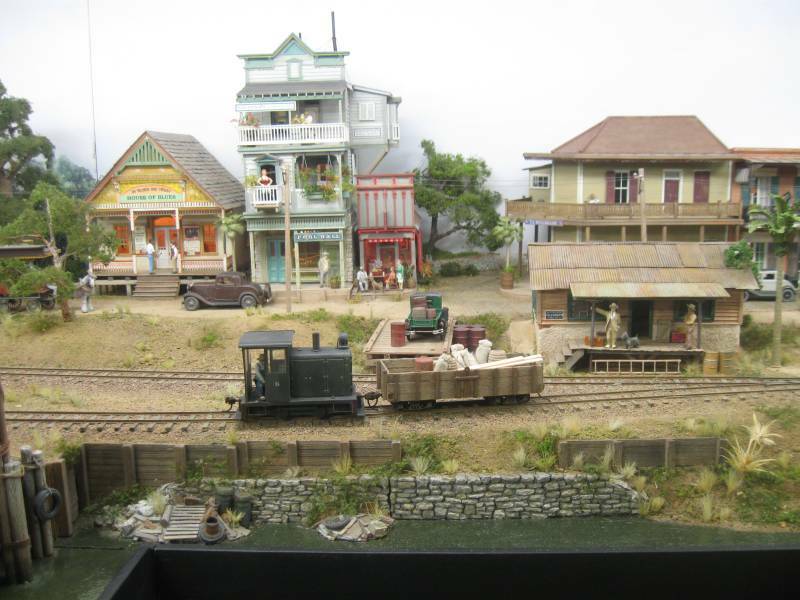 The articles appeared in Maine 2-Foot Modeler some years ago. Ron King who started Maine 2-Foot Modeler newsletter with Gary Kohler, before dropping off around issue #9. John Rogers an enthusiastic SR&RL modeler. He started in On2 just a few years OK. He and I had a number of good conversations about modeling the SR&RL in Sn2 and On2 along with operations. Steve King of 7/8n2 fame. His models and kits are beyond belief…I met all of these guys because I was standing by my SR&RL modules when they happened by. Had I not had the modules, we’d never had met….Another reason to present at the conventions…If your talking Maine 2-Foot, you must talk with Gary Kohler of Maine 2-Foot Quarterly publications. Gary and I had a few conversations as usual I’m certain something will result. There were a number of other “lurker” or “shy” Maine 2-Foot types and I hope to see them again in the future too. Cincinnati Friends – Like usual we had a Cincinnati dinner…A nice way to share time with Friends. 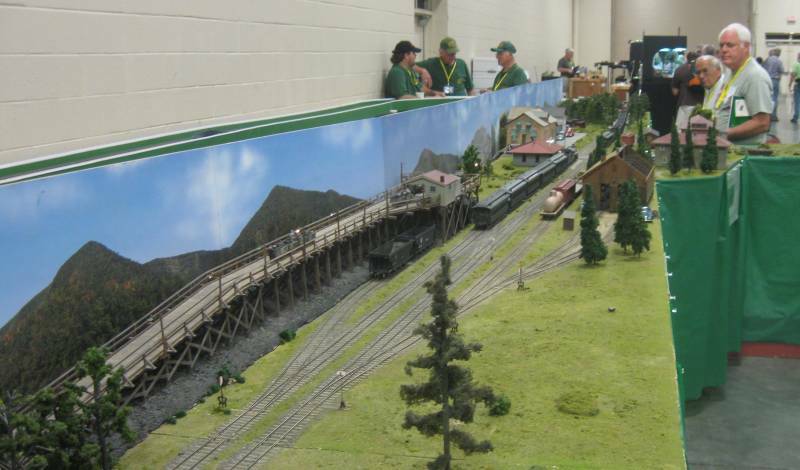 Sam Swanson and I joke that the only time we see each other is at Model Railroad events…I guess that’s life…. This convention was better than I expected. The venue was satisfactory and the organization crew and helpers were pleasant and informative. I got a cheap hotel ($49 a night on price line) saving my modeling dollars. Most importantly, I enjoyed the people with whom I shared my time…Thanks to all of you for making it a great convention. This entry was posted in Events, Free-mo. Bookmark the permalink.